We have the benefit of Historic records at our fingertips today. History is is behind us! We now have absolute proof the prophecies were fulfilled in the exact years the Bible said they would be. We now need to take advantage of these historic records and bring this Truth to the world!. Use the history books and share these facts with those that do not believe. Once they see this with their own eyes, they will believe. The list below is for those that already have a good understanding of the facts exposing Antichrist laid out here. It allows them to use "quick facts" to help generate a spark of interest in those the Lord sends their way. If this spark is ignited, and the seeker would like an in depth look at this prophetic facts, please visit the "Characteristics of Antichrist" page on this site for much more data. The whore will be a church & state combined. Revelation 17:3, "So he carried me away in the spirit into the wilderness: and I saw a woman sit upon a scarlet coloured beast, full of names of blasphemy, having seven heads and ten horns." Fact = Roman Catholic Vatican is a Church and a Nation at the same time. The whore of Babylon will sit upon 7 hills. Revelation 17:9, "And here is the mind which hath wisdom. The seven heads are seven mountains, on which the woman sitteth." Fact : Documented Roman Catholic source states "It is within the city of Rome, called The City on Seven Hills, that the entire area of Vatican State Proper is now confined" The Catholic Encyclopedia, p. 529. Rome is known to be built upon seven hills. Rome was said to have been founded when Romulus and Remus, twin sons of Mars, ended up at the foot of the hill Palatine and founded the city. The other six hills are Capitoline (the seat of government), Quirinal, Viminal, Esquiline, Caelian, and Aventine.-"Geography.about.com"
The Beast will rise from the "sea"
Revelation 13:1, "And I stood upon the sand of the sea, and saw a beast rise up out of the sea, having seven heads and ten horns, and upon his horns ten crowns, and upon his heads the name of blasphemy." Sea = "peoples, nations and tongues"
Fact: Roman Catholicism arose out of Western Europe with a multitude of "peoples, nations, and tongues" as parishoners. And presently the Roman Catholic church sports the highest number of "peoples, nations and tongues" in any church the world over. And now, after the prophecied One World Church coming to fruition on June 26, 2000, the Pope was elected as leader to all churches that have joined with His. This nearly doubled the church membership in the first 5 years. Soon, all churches, including non-Christian faiths will declare the pope their "moral" leader. Fact: As of June 2008 174 Nations out of the 192 on Earth have state representatives at the Vatican. The four Beasts of Daniel will join as one in the last days as Antichrist. Daniel 7:2, "Daniel spake and said, I saw in my vision by night, and, behold, the four winds of the heaven strove upon the great sea." Antichrist will be a strong Political power. Revelation 13:3, "...all the world wondered after the beast." Revelation 13:7, "... power was given him over all kindreds, and tongues, and nations." Fact: Roman Catholic Author, Malachi Martin states in his book The Keys of this Blood: "He is as determined to be world ruler as was Constantine in his day (p.49) He is protected by four governments (p. 120) He is the best-known person of the 20th century (p. 123) He is personal friends with the leaders of 91 countries (p. 490) People of the world seem to him ready for strong worldwide moral government with control (p. 160). Sixteen thousand journalists covered his American visit (p. 490)"
Fact: "During the 2,000 years the [Roman Catholic] Church has been on this earth, she has warred with nearly every government in this world. The world is full of their ruins. Their thrones have toppled over and fallen, their dynasties have come to dust. And the governments of the world today will meet the same fate if they challenge the hostility of the church of God. She remains; she is today what she was 2,000 years ago; . . she is today what she was during the Middle Ages; she is today what she was during the times of Protestant persecution during and since the sixteenth century; she is the invincible church of God. God help the state that attacks her; God help the king that provokes her hostility." --from a sermon by the Catholic priest D.S. Phelan on Sunday, Dec. 12, 1909, published in the Roman Catholic (St. Louis) periodical, The Western Watchman, Dec. 16, 1909. Antichrist will be a strong Religious power. Revelation 13:3, "...and all the world wondered after the beast." Revelation 13:8, "And all that dwell upon the earth shall worship him, whose names are not written in the book of life of the Lamb slain from the foundation of the world." The Beast will control a man and his name will equal 666. Revelation 13:17,18 "And that no man might buy or sell, save he that had the mark, or the name of the beast, or the number of his name. Here is wisdom. Let him that hath understanding count the number of the beast: for it is the number of a man; and his number is Six hundred threescore and six." Before showing the fulfillment on this one, I must show valid proof that the "name" of the beast is in fact the name he has chosen. All too often the name has been declared invalid by Rome. Fact: Roman Catholic Author Malachi Martin uses the exact same title for the Pope on pages 114 and 122 of his book, "The Keys of this Blood." Since this evidence came forth regarding the title, "Vicarius Filii Dei," and it's obvious connection to the 666 calculation of Revelation. The Roman Church has opted to teach it's followers to declare this title bogus and not a true title of the Popes. They have gone to great lengths seeking to lie to their people so as to remove the overwhelming evidence against them. However, this ministry has found additional documented facts from official Roman Catholic sources regarding this title. Vicarius Filii Dei, is cited by the rector of Berlin, Andreas Helwig [or Helwich] (1572-1643) in his Antichristus Romanus. You also might want to take a look at another facsimilie of the NOV 15, 1914 edition of OUR SUNDAY VISITOR (A Catholic publication) that openly uses the term Vicarius Filli Dei, as well as states THE NAME IS INSCRIBED ON THE POPES MITRE! You can view the actual document by clicking here. Not only does that publication show the title, "Vicarius Filii Dei, it also explains that it is considered a valid title as they do not refute that. Instead they attempt to epxlain why it it a trivial matter that it equals 666. One more note of interest! Why is it I ask, when you go to the archives of "Our Sunday Visitor" that this particular edition is missing? Why is it so difficult to get a copy of page THREE of the Nov 15, 1914 "Our Sunday Visitor?" It's obvious, they are purposely trying to hide the truth. Praise the Lord there are people that have copies of this publication outside Vatican control. Lately, many defending the Vatican have declared the use of the "V" twice in "Vicarivs" is invalid. However, if you research it out you will find the letter "V" was used in Roman times as a vowel (U) or a Consonant. (V) This is a common practice among all languages. For example. The letter "C" can be used as a HARD C or a SOFT C in words. Or the Letter P can be used as a P or completely silent. For example, the P in "pig" is heard, wherein the "P" in "pneumonia" is not. Eyewitness testimony claims that Pope Gregory XVI (1831-1846) wore the inscribed tiara during the Easter Mass of 1845, and that the word Vicarius was on the top crown, Filii on the middle, and Dei on the lower crown, the words spelled out with jewels. See... The Number of his Name. The Roman Church would reign for 1260 years before being "wounded unto death." Revelation 13:5, "And there was given unto him a mouth speaking great things and blasphemies; and power was given unto him to continue forty and two months." click here to get a better understanding of the 1260 years. Historical records reveal the papacy began its reign in 538 AD upon Emperor Justinian's decree, and under the military protection of Belisarius. And the Bible says the beast will rule for EXACTLY 1260 years before receiving a mortal wound. Now it's just a matter of simple mathematics. It is also a grand method by which to see the Lord glorified. If the prophecy is correct, 1260 years after 538 AD the Beast must receive a mortal wound. If you add 1260 years to the beginning year the Roman Catholic church became a church and state power, 538 AD, you will arrive in the year 1798 AD. According to the Bible we are told the first reign of the Beast will last 1260 years, and by doing the math, that comes to the year 1798. Did it end in 1798, and how? First understand, according to the prophecy, we learn that, "He that leadeth into captivity shall go into captivity: he that killeth with the sword must be killed with the sword..." Revelation 13:10.
for a "pop up" that will explain the "42 months" as prophecy depicts. The Roman Church / Antichrist will receive a deadly wound. -Revelation 13:3, "And I saw one of his heads as it were wounded to death..."
Revelation 13:3, "... his deadly wound was healed: and all the world wondered after the beast." 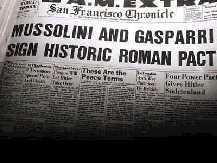 Mussolini and (Cardinal) Gasspari sign historic Roman pact. The beast is one that "was", "is not" and "yet is". Revelation 17:8, "...behold the beast that was, and is not, and yet is." ...and is not: From 1798ad until the signing of the Lateran treaty in 1929 the Roman Church/state was non-existent. ...yet is: From 1929 to present the Roman Church has been a church & state. John 10:33, "The Jews answered him, saying, For a good work we stone thee not; but for blasphemy; and because that thou, being a man, makest thyself God." Mark 2:7, "Why doth this man thus speak blasphemies? who can forgive sins but God only?" Fact: Documented Roman Catholic source states "The Pope is not only the representative of Jesus Christ, he is Jesus Christ himself, hidden under the veil of flesh." Catholic National July 1895. Fact: The "confessional" of the Roman Catholic Church is indeed yet another identifiable feature exposing the Vatican as Antichrist's dwelling. They openly declare a MAN dressed as a priest has the power to FORGIVE SINS! Daniel 7:8, "I considered the horns, and, behold, there came up among them another little horn, before whom there were three of the first horns plucked up by the roots: and, behold, in this horn were eyes like the eyes of man, and a mouth speaking great things." The beast will understand the dark methods of the Occult, and do as Satan requests. Daniel 8:23, "And in the latter time of their kingdom, when the transgressors are come to the full, a king of fierce countenance, and understanding dark sentences, shall stand up." Two Eminent Churchmen Declare "Satanism Is Practiced in Vatican!" Fact: Documented Roman Catholic source states- "In recent weeks, a firestorm has been raging in Italy. The controversy revolves around the statements Archbishop Emmanuel Milingo, who made formal allegations that satanic activity is taking place inside the Vatican. When questioned by the Italian press about the allegations, he said that he stood by them. The Archbishop chose the Fatima 2000 International Congress on World Peace held in Rome in November 1996 hosted by the Fatima Crusader magazine as a platform to first make these allegations public. The beast will seek to change times and laws. Daniel 7:25, "And he shall... think to change times and laws:." Fact: Documented Roman Catholic source states- "The Pope has the power to change times, to abrogate laws, and to dispense with all things, even the precepts of Christ." "The Pope has the authority and often exercised it, to dispense with the command of Christ." Decretal, de Tranlatic Episcop. Cap. (The Pope can modify divine law.) Ferraris' Ecclesiastical Dictionary. Fact: Documented Roman Catholic source states- "The Pope is of great authority and power that he can modify, explain, or interpret even divine laws... The Pope can modify divine law, since his power is not of man, but of God, and he acts as vicegerent of God upon earth." -Lucius Ferraris, Prompta Ribliotheca, "Papa," art. 2, translated. Revelation 13:4, "And they worshipped the dragon which gave power unto the beast..."
Fact: Documented Roman Catholic source states Pope Pius IX, in his "Discorsi" (I., p. 253), said: "The Caesar who now addresses you, and to whom alone are obedience and fidelity due." Fact: [Speaking of the time, about 500 A.D., when the Roman Empire was crumbling to pieces:] "No, the [Catholic] Church will not descend into the tomb. It will survive the Empire . . . At length a second empire will arise, and of this empire the Pope will be the master--more then this, he will be the master of Europe. He will dictate his orders to kings who will obey them"--Andrea Lagarde, The Latin Church in the Middle Ages, 1915, p. vi. Revelation 17:5, "And upon her forehead was a name written, MYSTERY, BABYLON THE GREAT, THE MOTHER OF HARLOTS AND ABOMINATIONS OF THE EARTH." It will attack the children of the Creator. Revelation 13:7, "And it was given unto him to make war with the saints..."
Daniel 7:25, "And he shall wear out the saints of the most High..."
Fact: "The Catholic has some reason on his side when he calls for the temporal punishment of heretics, for he claims the true title of Christian for himself exclusively, and professes to be taught by the never-failing presence of the Spirit of God . . . It is not more 'morally' wrong to put a man to death for heresy than for murder, . . . [and] in many cases persecution for religious opinions is not only permissible, but highly advisable and necessary." --"The Lawfulness of Persecution," in The Rambler, 4, June, 1849, pp. 119, 126 ["The Rambler" was an English Roman Catholic journal published from 1848 to 1862].. Fact: Under the influence of Germanic customs and concepts, torture was little used from the 9th to the 12th centuries, but with the revival of Roman law the practice was reestablished in the 12th century... In 1252 (Pope) Innocent IV sanctioned the infliction of torture by the civil authorities upon heretics, and torture came to have a recognized place in the procedure of the inquisitional courts. -New Catholic Encyclopedia, arts. "Inquisition", "Auto-da-Fe'," and "Massacre of St Bartholomew's Day." Revelation 17:5, "And upon her forehead was a name written, MYSTERY, BABYLON THE GREAT..."
Fact: "Long ages ago, when Rome through the neglect of the Western emperors was left to the mercy of the barbarous hordes, the Romans turned to one figure for aid and protection, and asked him to rule them; and thus, . . . commenced the temporal sovereignty of the popes. And meekly stepping to the throne of Caesar, the vicar of Christ took up the scepter to which the emperors and kings of Europe were to bow in reverence through so many ages." --American Catholic Quarterly Review, April, 1911.